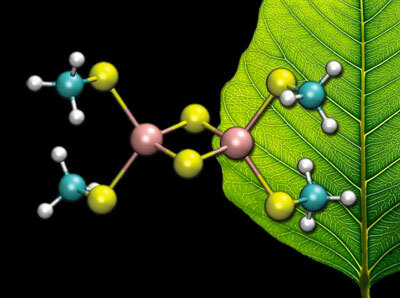 (Nanowerk News) Enzymes carry out fundamental biological processes such as photosynthesis, nitrogen fixation and respiration, with the help of clusters of metal atoms as "active" sites. But scientists lack basic information about their function because the states thought to be critical to their chemical abilities cannot be experimentally observed. Now, researchers at Princeton University have reported the first direct observation of the electronic states of iron-sulfur clusters, common to many enzyme active sites. Published on August 31 in the journal Nature Chemistry ("Low-energy spectrum of iron–sulfur clusters directly from many-particle quantum mechanics"), the states were revealed by computing the complicated quantum mechanical behavior of the electrons in the clusters. "These complexes were thought of as impossible to model, due to the complexity of the quantum mechanics," said Garnet Chan, the A. Barton Hepburn Professor of Chemistry and corresponding author on the paper. This is an image of a [2Fe-2S] cluster. In these systems, the electrons interact strongly with each other, their movements resembling a complicated dance. To reduce the complexity, the researchers drew on a new understanding, gained from fundamental work in quantum information theory, that the motion of the electrons had a special pattern. "At first glance, the electrons appear to move in a complicated way, but eventually you realize that they only care about what their immediate neighbors are doing, similar to being in a crowded room. This restriction on their behavior leads to important simplifications: the calculations become very difficult rather than impossible -- it's just on the edge of what can be done," Chan said. Using their new method, Chan and coworkers found that iron-sulfur clusters possess an order of magnitude more accessible electronic states than previously reported. The researchers suggested that this unusual richness might explain their ubiquity in biological processes. This finding, that there are many more available electronic states than previously thought, presents many different chemical possibilities. What if these clusters simultaneously used a combination of mechanisms, instead of the accepted chemical idea that there is one distinct electronic pathway, Chan wondered. To test that idea and learn more about the clusters' behavior, the researchers plan to extend their calculations to observe a chemical transformation in action. "If you want to understand why iron-sulfur clusters are a ubiquitous biological motif and how we can create even better synthetic analogs, then you need to know what the electrons are doing," Chan said. "Now we've caught a first glimpse as to what they are getting up to."